I never went to my high school prom which was a smart move because all those that went are still being haunted by Facebook taggings. This is the kind of thing that mortifies me even by proxy. One boy, who shall remain nameless but let’s call him Moose Knuckles, was somebody’s older brother and mercy date to a girl in a see-through dress who forgot to hone her eating disorder in a pre-Spanx era. He wore trousers so high-waisted and tight that his junk had nowhere to go but up and sideways. And forever emblazoned in our memories. Oh how I love to creep on that profile when I am sad and having a bad hair day. And here we are today, this is Evangeline and her brother, Freddy, on prom day last Friday. We had a gaggle of girls (and some parents) over for a pre-prom primping party. They graduated from Rosedale School of the Arts which is not the usual Abercrombie crowd we’re talking about. If you’ve ever been on Bloor and Castle Frank when school lets out, you know what I’m talking about. I am sure some girls wore dresses crafted out of hair grown on their heads. There are also slim pickins of boys at the school. Because of lack of male escorts (IT DOESN’T GET BETTER), Evangeline and her prom posse all went as one girl power unit. They took the streetcar! How cute is that? “Any dietary restrictions?” was the first question our charming waitress asked. This is because you have no choice! This is heaven to me, you eat what you get, homestyle, and you are served all the courses in Le Creuset baking dishes. Even as a low funtioning cook in my own kitchen, I can tell you, it is a goal of mine to own a Le Creuset pot in every shape, size, and colour. I would just look at them and dream of bubbling cheese. I do have a nice sized green one, though, that is the vessel to my famous Chicken Rinaldo every Monday night. 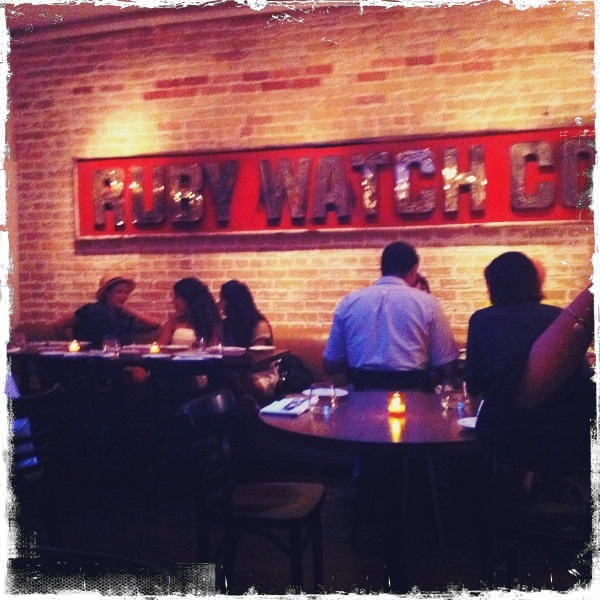 Here is the Ruby Watchco website and you can see what’s on menu of the day. While I would never admit to having dietary restrictions, I will confess to having certain dietary malfunctions which are sparked by peaches, ice cream, and seafood. The first item makes my face bulge, my tongue swell, and my hair follicles super itchy. The second thing makes me poop immediately. So what? I make sure I eat it at home. The third makes my stomach churn first and then poopalooza. Again, so what? “Take the pain,” I always say to the weaklings in my Tom Berenger voice. And on the menu was fish which I love, by the way, but it doesn’t love me back which is the saddest and purest love of all. The other courses were so delicious, fresh and local. There was is a salad with baked prosciutto (“Always invite pork to a party,” said a wise host), and the wait staff was fantastic. They saw us fighting over the last piece of bacon, and they brought us a whole bunch more IN THE CUTEST LE CREUSET DISH OF ALL. The fish, which was Halibut with shrimp salsa, was phenomenal. We ended it with “thermalized” cheese and chocolate mousse dessert. It was awesome and the best restaurant experience I’ve had in Toronto for sure. Chef Lynn came to our table and chatted us, and we were all completely smitten with girl crushes. She is a culinary Goddess. And between you and me, even going to the washroom was magical. I swear it smelled of lavender in there.